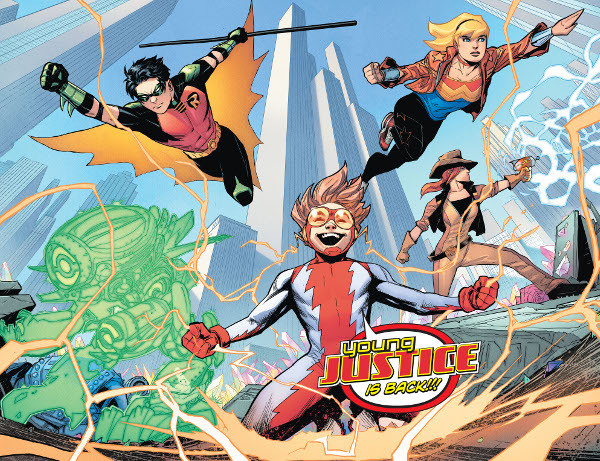 DC Comics relaunches Young Justice as part of their new teen-focused Wonder Comics line. The first issue follows the basic formula of a threat large enough it causes a group of heroes to converge and become a team. Issue #1's threat are invaders from Gemworld, a threat met head-on by new character Jinny Hex only recently arrived to Metropolis who is joined by Young Justice staples Robin, Impulse, and a reluctant Wonder Girl who all arrive separately to the scene. They are also joined by a new Teen Lantern. Mostly set-up, Young Justice #1 introduces us to most of the key characters of the team (including the final two members who won't show up until the end) while setting up a threat large enough that it will require the heroes to stay together to fight. Having our heroes be separated and sucked into Gemworld to meet new threats and allies offers an interesting twist headed into the comic's second issue. With a feel of classic Teen Titans and original Young Justice stories, the new comic offers a solid opening. Like Bart, I'm excited to see what happens next. Worth a look.